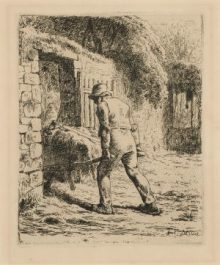 Composed after a photograph by the French photographer Nadar, this etching captures the immediacy of the original photographic image. 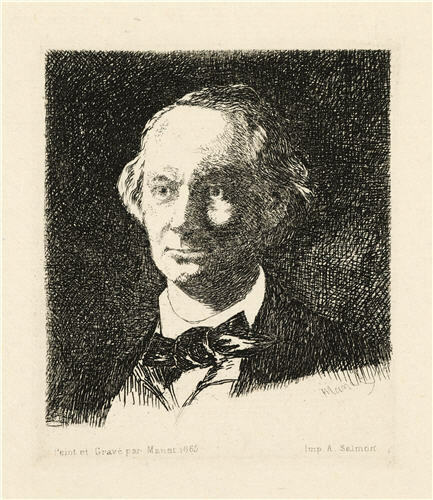 The short busy lines swirl across the paper to build up the likeness of the art critic and poet Charles Baudelaire. Nadar took a direct approach to his portraiture, intending to capture the personality of his famous sitters. Manet’s approach was equally direct, eliminating any sense of background in a black mass that encroaches upon the sitter. Baudelaire stares out, off centre, with a disturbingly fixed gaze. The visible lines in the background seem to pulse with life. The dark and brooding atmosphere of this portrait is appropriate for the translator of the macabre and Gothic Edgar Allan Poe.